Andy Birchall onboard the Falmouth Severn class all weather lifeboat. A Falmouth man linked by family to a dramatic rescue in North Wales in 1859 has raised a massive £20,000 for the RNLI. Andy Birchall circumnavigated Britain to salute the charities past and present lifeboat volunteers after researching the story of his great, great Grandfather who lost his life in a shipping tragedy off Anglesey. 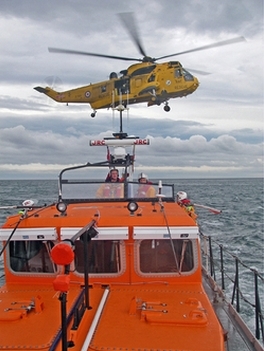 The money will be used to support the training of twenty volunteer RNLI crew members for a year. 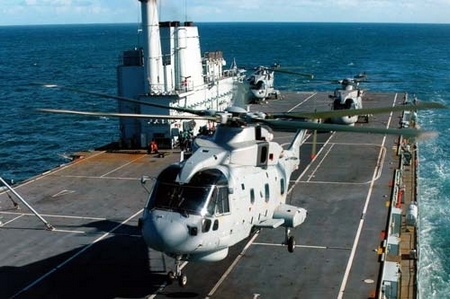 Cash strapped Blair Brown Regime has been trying to privatize British helicopter SAR coverage, including cover in the Falklands Islands, to avoid having to fund 40 new helicopters to replace the aging Sea Kings flown by RAF, FAA and MSA crews. The British consortium, including Bristow and Agusta Westland, have withdrawn from bidding and stories are circulating that the two foreign bidders are considering withdrawal unless the value of the PFI contract is significantly increased. The story also circulating is that Regime is attempting to blackmail the British consortium into re-entering the bidding by threatening that the companies making up the consortium will be blackballed from bidding for any other British Government contracts in the future unless they re-enter the bidding for this contentious PFI contract. The core of the problem is that the Regime has run out of money as Britain heads deep into recession. As Scottish Prime Minister, unelected, “Bottler” Brown has admitted, Britain is leading the world towards Depression. At stake is the safety of all those in peril who depend on the heroic performances of British SAR helicopter crews. 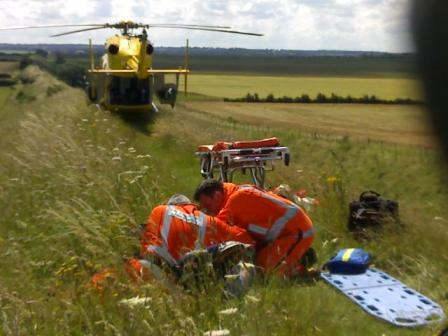 The East Anglian Air Ambulance, typical of the voluntary air ambulance/SAR services provided in Britain by charitable Trusts – A 365 day-a-year life-saving service across Bedfordshire, Cambridgeshire, Norfolk and Suffolk. The charity is independent of government and National Lottery funding and is entirely dependent on fund-raising and contributions. To keep its two air ambulances flying, and to provide the advanced medical equipment they carry, over £3 million per year has to be raised. There is a further dimension. The Marine Safety Agency provides Coast Guard services and does not have to operate its own SAR crews. It has always relied heavily on the RNLI which is a voluntary organization funded by donations from the public. RNLI lifeboat crews are in daily action around the coasts of Britain and the Irish Republic, receiving no money from the British Government for their outstanding service. There is always the option of replacing MSA helicopters with voluntary SAR Trusts in an expansion of the existing and growing network of Air Ambulance services, working closely with the RNLI for over-water SAR coverage. 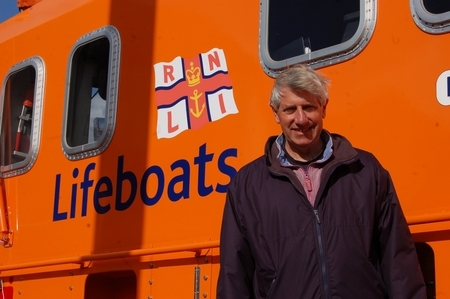 The RNLI itself is also expanding its services to the public at no cost to the Government. RNLI hovercraft and lifeboats already assist police and other emergency services in the recovery of bodies and in searches for missing people on estuary and inland waters. In addition, the RNLI has formed teams specifically to go to areas of flooding inland to assist the rescue and evacuation of those trapped by floods. The Blair Brown Regime has failed to take the opportunity to consider encouraging an expansion of voluntary services to provide SAR helicopters. The Agusta Westland EH101 Merlin has replaced the aging Sea King in a range of FAA roles and is being supplied to the US as the new Marine One Presidential helicopter, replacing the Sea King for US Presidential helicopter transportation. A variant equipped for in-flight refueling and ground suppression would be a logical helicopter to replace the Sea King for British Military SAR and battlefield extraction duties. Then there is the matter of the military provision of SAR helicopters. At present, the main coverage is provided by RAF and Fleet Air Arm crews flying military Sea King helicopters. 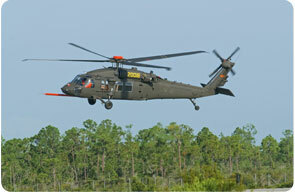 Most of the 40 new helicopters would be required to replace military crews and Sea Kings. To privatize this coverage overlooks the fact that RAF and FAA helicopters are provided principally to enable these military services to provide SAR and battlefield extraction of downed aircrew. In peacetime they are available for civil SAR and this enables them to train and operate under extreme conditions performing valuable SAR services to sailors and others at risk. This primary mission has been neglected during the last ten years and resulted in the crews having to fly aging helicopters that are unable to provide state of the art military SAR. 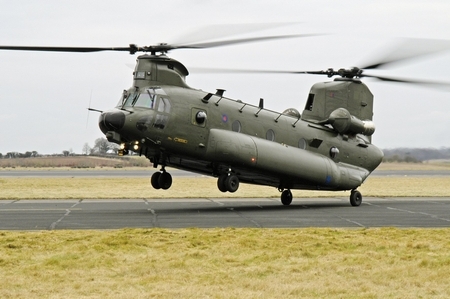 The Boeing Chinook is an unsuitable helicopter for battlefield SAR/extraction, even when fitted with a winch, being designed as a heavy transport that ferries troops and supplies into and out of landing zones. A small number were built for British Special Operations but have been dogged by software and equipment problems, largely resulting from attempts by the Blair Brown Regime to cut costs. Those in British service have a history of software problems that have caused at least one major crash. Recently, a British soldier died in Afghanistan because the RAF only had a Chinook helicopter without a winch to recover a group of soldiers from a minefield. The downraft from the Chinook rotors is believed to have triggered the mine that killed the soldier. After a delay of hours, the RAF had to request an American winch equipped Blackhawk to recover wounded and bodies from the minefield. Until the present SAR chaos is resolved, military and Coast Guard crews will continue to provide a SAR capability in aging Sea King helicopters. As the Sea King disappears from the British military inventory, the cost of keeping the SAR Sea Kings flying will increase and become problematic. This is however not a new problem. It was already agreed in 1996 that the Sea King should be replaced and the Major Administration had assumed that a Merlin variant would be the logical option for military SAR, with consideration being given to the possibility of expanding voluntary SAR services in addition to maintaining a military SAR capability. When the Blair Brown Regime came to power in 1997, this as considered a trivial matter and then later subjected to the incompetent indecision that has characterized the Blair Brown Regime. Now, more than twelve years on, Britain still awaits a resolution to a vital emergency service and lives are placed at risk. 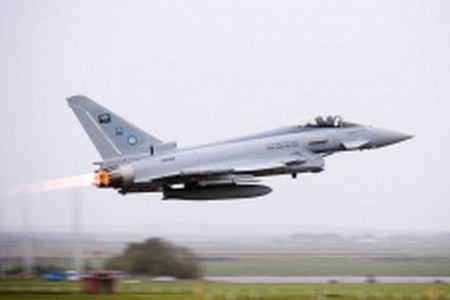 A Eurofighter Typhoon fighter aircraft in the full two-tone grey livery of the Royal Saudi Air Force (RSAF) has flown for the first time today at BAE Systems’ Warton Aerodrome in Lancashire, North West England. This milestone marks the start of an initial test flight programme for RSAF Eurofighter Typhoon aircraft being assembled at Warton. In December 2005, the Saudi Arabian and UK Governments announced the signing of an Understanding Document that aimed to establish a greater partnership in modernising the Saudi Armed Forces. 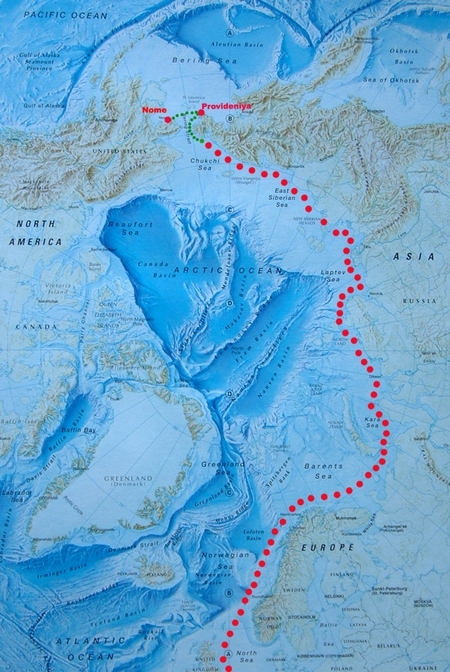 This paved the way for the acquisition of 72 Eurofighter Typhoon aircraft, and the transfer of technology, investment and training, confirmed on 17 September 2007. SUNNYVALE, Calif., October 22nd, 2008 — Lockheed Martin [NYSE: LMT] has delivered the latest block of flight software for the first geosynchronous orbit (GEO-1) spacecraft in the Space Based Infrared System (SBIRS) program. The U.S. Air Force’s SBIRS program is designed to provide early warning of missile launches, and simultaneously support other missions, including missile defense, technical intelligence and battlespace awareness. The software is an interim version of the second of two major blocks of enhanced flight software designed to provide highly reliable spacecraft command and control operations. It provides the functionality necessary to begin Baseline Integrated System Testing (BIST), which will characterize the performance of the integrated satellite and establish a performance baseline prior to entering thermal vacuum testing next year. WASHINGTON, Oct. 21 — On election night, millions of deaf and hard-of-hearing people will be able to experience live radio coverage for the first time, when NPR, Harris Corporation and Towson University simulcast the first ever live, captioned radio broadcast. NPR News’ extensive election night coverage will be simulcast in the new captioned radio format, providing accessible news and journalism to deaf and hard-of-hearing communities. Captioning for the historic broadcast is being provided by WGBH’s Media Access Group. 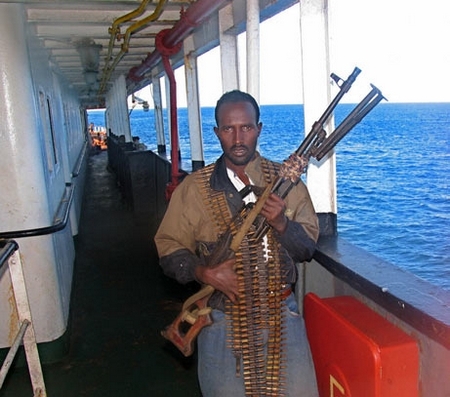 United Nations Secretary General Ban Ki-moon has pledged his support for an extension of the mandate, given in United Nations Security Council resolution 1816 (2008), enabling States co-operating with the Transitional Federal Government of Somalia to enter the country’s territorial waters and use all necessary means in order to repress acts of piracy and armed robbery at sea, consistent with relevant international law. That mandate is due to expire on 1 December 2008, i.e. six months after the adoption of the resolution, on 2 June 2008. Blair Brown Regime sidekicks have been enjoying the World financial melt-down because they believe this will help “Bottler” Brown to cling on to power and win the next election. Several gleeful aides have described the situation as Bottler’s Falklands moment. What they mean is that they think the financial disaster, that was contributed to strongly by Bottler’s ineptitude as Chancellor and then as Prime Minister, will provide an election bounce similar to that enjoyed by Margaret Thatcher after her Falklands Campaign victory. That is a typical misunderstanding of history on the part of Blair Brown Regime propagandists. Margaret Thatcher had lost popularity in her first term because she had taken tough decisions to clear up the appalling mess left by the Labour Government that she had replaced, a traditional situation faced by each Conservative Government when taking over the wreckage left by a Labour administration. In a rapid response to the invasion of the Falklands Islands by Argentine bandits, she assembled a Task Force and dispatched it to the distant Falklands Islands where it ejected the Argentine criminals. The electorate recognized her courage both in dealing with the mess left by Labour and the situation created by Argentine national socialists, rewarding her with a sizable Parliamentary majority at the next election. In contrast, Bottler has dithered for six years as the economic storm clouds gathered and then taken a year of further dithering after the first serious symptoms of impeding disaster were visible. Although the propagandists may be wrong about their perceived environment, this could well be Bottler’s Falklands/Galetieri Moment. He has just declared war on Iceland to project an image of decisive leadership. Like any bully, he saw tiny Iceland as an easy target in a moment equal to General Galtieri’s miscalculation when he ordered the invasion of the Falklands. He decided to employ anti-terror legislation to seize Icelandic assets, overlooking that the only two occasions when Britain has taken on Iceland before, the so-called Cod Wars, Iceland was the victor. Faced with financial wipeout by Bottler Brown, the Icelanders have naturally looked for allies and financial support. Russia has stepped forward and is understood to have offered Iceland a complete financial bail-out in return for long leases on former US military installations for the use of Russian forces. Ironic if Russian national socialists ride to the rescue of little Iceland, ejecting Brown’s national socialist bandits. 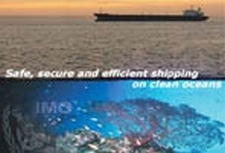 The Marine Environment Protection Committee (MEPC) of the International Maritime Organization (IMO) approved, without reservations, the text of the draft ship recycling convention for adoption at a conference in 2009, when it met for its 58th session at IMO’s London headquarters. The MEPC conducted an article-by-article and regulation-by-regulation review of the draft new convention providing globally applicable regulations for ship recycling and for recycling activities. The text will now be circulated for consideration and adoption by a diplomatic conference to be held in Hong Kong, China, from 11 to 15 May 2009. The Marine Environment Protection Committee (MEPC) of the International Maritime Organization (IMO) unanimously adopted amendments to the MARPOL Annex VI regulations to reduce harmful emissions from ships even further, when it met for its 58th session at IMO’s London headquarters.